As I was rushing down Frome Road to make it to the Foundation Stage in time to catch Mountain Mocha Kilimanjaro’s 5pm performance, my left sandal came apart. This isn’t really unusual, because my thongs are three years old and almost worn through, and pop apart fairly regularly. They were slated for retirement after WOMADelaide, but sadly, they couldn’t keep up their end of the bargain, it seems, because this time, the thongy bit broke right apart, and that, as they say, was that. Unfazed, I went full hippie barefoot, which thankfully, is kind of the way to go at WOMADelaide, as Botanic Park’s grass is soft and cool, and feels wonderful. As I entered, I heard the closing strains of Ainslie Wills’ performance, and was sad to have missed her, but from what I did hear, it sounded like she’d rocked the Novatech Stage mightily, and I resolved to check her album out and keep an eye out for her in the future. 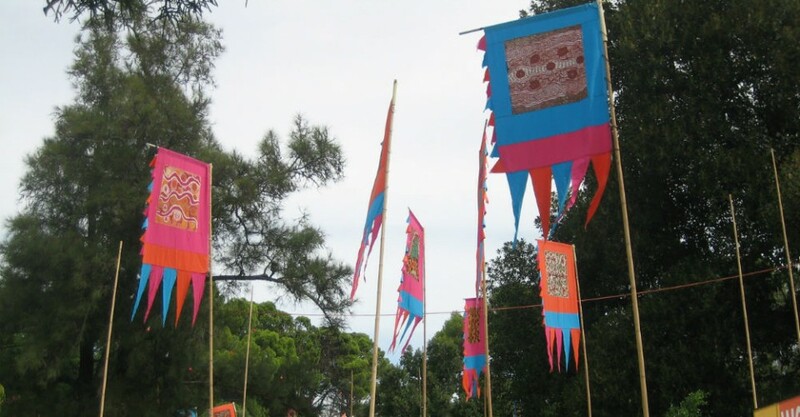 WOMADelaide is fantastic that way, in that now I have fifteen new favourite bands to become more familiar with, and even more that warrant further investigation. Hyping up the crowd with repeated shouts of, “Are you ready?? ?”, these Japanese funkateers proceeded to promptly burn down the stage with jams that would make James Brown and George Clinton proud. Shamelessly repurposing the sounds of the Godfather Of Soul, Parliament, and even Band Of Gypsys, they were unstoppable. These guys have their showmanship down, with songs blending into one another seamlessly and flamboyant solos that always earned applause from the audience who danced nonstop through the hour set. I’d wanted to make it to Spiro’s 1pm set, but couldn’t make it work, resigned instead to check out their 6pm spot in the schedule, curiously marked WM. I was elated to discover that it was a workshop, which I arrived at in progress due to a slight overlap with MMK’s set. I found a very chill scene of a hundred or so people relaxing in the grass, listening to the semi-traditional English instrumental folk ensemble’s deliberate deconstruction of their methods. Not long after I’d taken my seat, guitarist Jon Hunt carefully explained the arrangement of Shaft, the group’s take on the North East English folk song, Bobby Shafto’s Gone To Sea. He introduced each member of the group, and invited them to perform their intricately interlaced contributions to each section of the song over the course of fifteen minutes filled with anecdotes and banter. Having thoughtfully demonstrated all of the moving parts, several of which could be modestly classified as technically challenging, they finally performed the entire piece together, providing a musical revelation of the sort you don’t see everyday, and then opened the panel to questions from the audience. Having come nearly to the end of their time, they closed with a request that they’d not played at their earlier set, the cosmic transcendence meditation We Will Be Absorbed, and its beauty made time stand still for a moment. Once its final notes rang out, with the spell broken, Hunt acknowledged that this was the best festival they’d ever played, and the audience showed its gratitude for the generous opportunity to peek behind the curtain. After checking in with fellow Clothesline correspondent David Robinson for a quick catch-up, I was off to see Zimbabwe-born Londonite and 2015 Mercury Prize shortlister Eska light up the Zoo Stage. I’m not even sure how to describe what I saw. The music spanned so many genres, like a pebble skipping across reggae, ambient, soul, gospel, and the list could go on for awhile. At the centre of it all, Eska’s heart and emotive vocals shone through with tales of positivity and hope. Keeping it loose, the band was given a number of opportunities to jam, often quietly and beautifully, as one song ended with a backwards looped snippet of guitar against a bowed saw, and another with bass harmonics and violin. As the set went on, the enchanted audience were treated to powerful renditions of To Be Remembered and She’s In The Flowers, both from Eska’s acclaimed eponymous debut, before she kindly invited the audience to stand and groove to a cover of (I Can’t Get No) Satisfaction that was more Devo than Stones. The band navigated the odd time signatures of Shades Of Blue without sign of effort, and then Eska closed out with her album opening, This Is How A Garden Grows. The audience gently encouraged an encore and was rewarded, with Eska improvising to advise members of the crowd that they were glowing. It was a special performance to finish out my first WOMADelaide, bringing a tear to my eye. So ends my coverage of WOMADelaide 2016. Thank you for reading, and do feel free to bookmark The Clothesline and follow us for more Adelaide arts coverage on Facebook and/or Twitter. When he's not playing his drums, moonlighting as a singer/songwriter or working his day job as an IT analyst, Matt Saunders writes reviews for MusicSA, BSide Magazine and The Clothesline. He minored in journalism at Uni, so reviewing music and events is a way to indulge his love of the arts, journalism and Adelaide while turning people on to some of the cool things going on around town.